Residents are invited to come along and have their say on a proposed new play park at Rectory Park Play Area. Armagh City, Banbridge and Craigavon Borough Council is hosting a public meeting at Regenerate, 1B Ardress Park on Tuesday 16th April 2019 to discuss the equipment, layout and design. At the meeting residents will be given the chance to have their questions answered about the proposed play area and learn how council aims to implement the good practice design principles outlined within its play strategy, enhancing play value at existing sites and ensuring the future new development delivers a quality play experience for everyone. For more information, contact the play development officer on 0300 0300 900. The Mae Murray Foundation and PlayBoard NI are surveying parents and carers on play opportunities for children with disabilities. 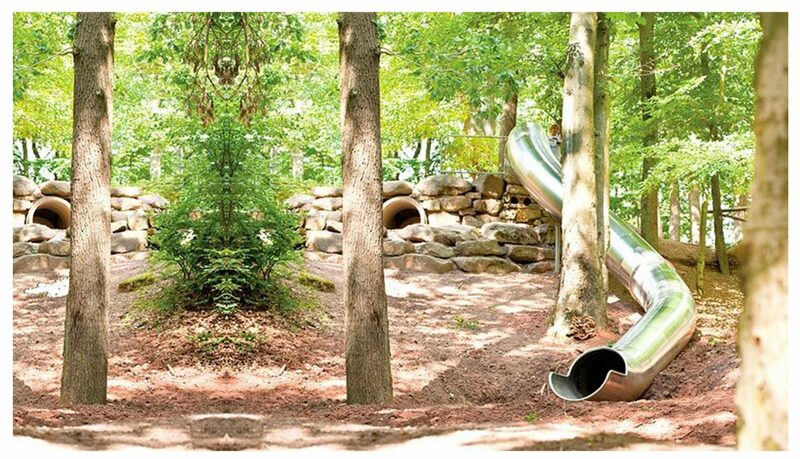 We are particularly interested in hearing views on fixed play areas i.e. play areas which have play equipment installed. 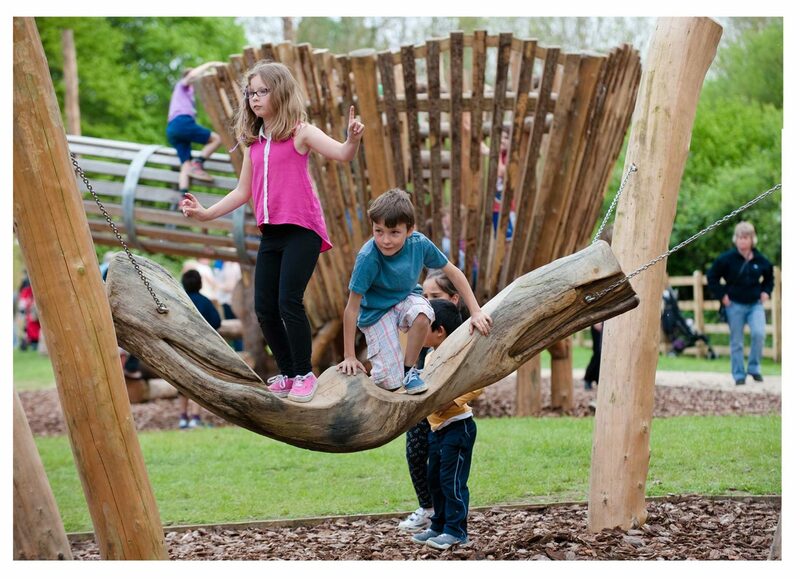 The information gathered through the survey will be used as the basis for a new guidance document which will aim to influence the design and development of more inclusive play areas that meet the needs of all children. We encourage parents and carers to complete the survey as we are keen to hear about the experiences of as many children as possible. The more people that take part, the bigger the impact we can make. 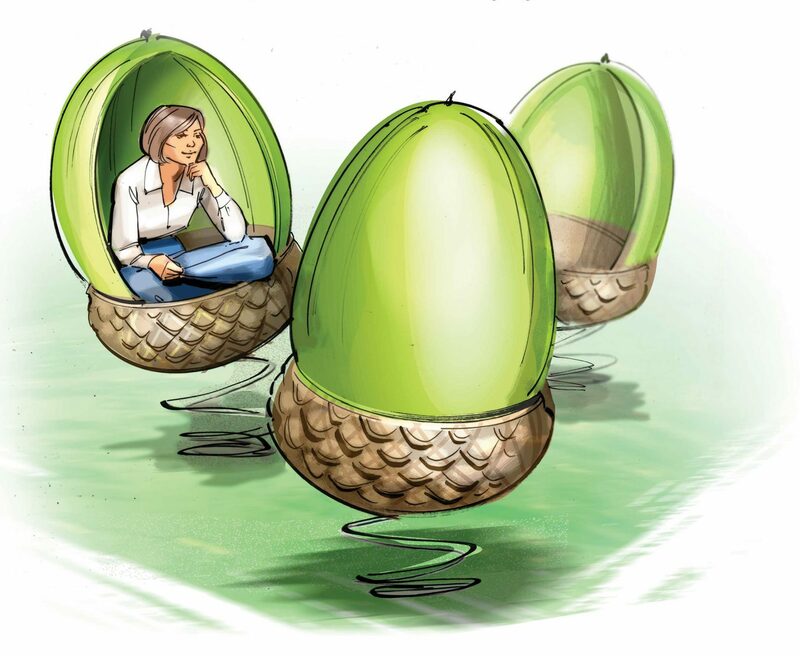 To complete the survey go to www.surveymonkey.co.uk/r/MMFPBParentsCarers before 30 April. 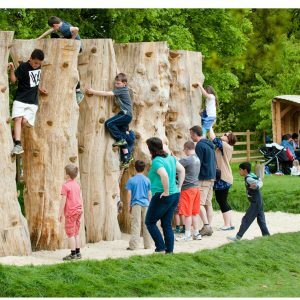 Armagh City, Banbridge and Craigavon Borough Council today have unveiled designs following the recent announcement that Gosford Forest Park is to benefit from an £850,000 investment to create a unique outdoor play adventure experience. Gosford Forest Park is located outside Markethill in County Armagh. The 240-hectare estate features miles of paths and trails around the beautiful woodland and open park spaces. Local people and families are encouraged to engage in a public consultation specially arranged to gain your views on the initial designs and will take place on Sunday 31st March at Gosford Forest Park, from 12noon to 5pm. Come along, meet the design team and have your say on their proposals – the design team will present detailed plans at 12noon and 3pm. 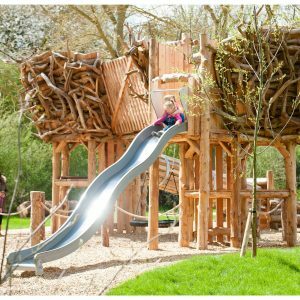 The Adventure Play Trail is being designed by award-winning landscape architects Davies White who have expertise in playful landscapes and innovative design. 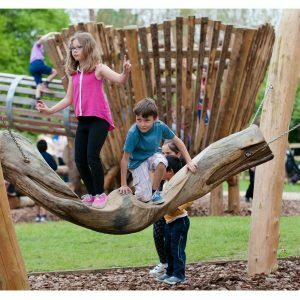 Since winning their first RHS Gold Medal and BBC People’s Choice Award the company have gone on to win over 15 national awards for innovative play space projects, including Glasgow’s Commonwealth Games Legacy Play Park. 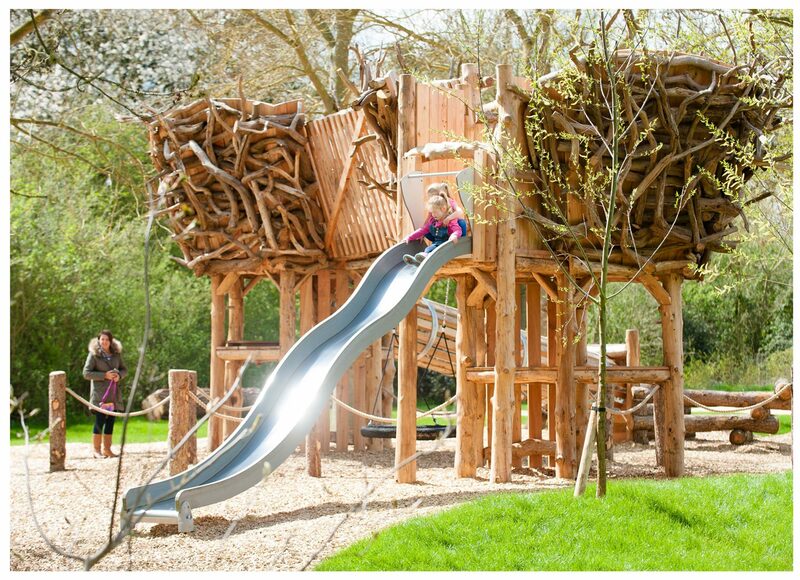 The designs for Gosford Forest Park will showcase 5 iconic play structures linked by a 2km woodland play trail. The new outdoor adventure play experience will not only satisfy the growing demand for more child-orientated experiences in the Northern Ireland tourism market, it will establish Gosford Forest Park on a scale that is unprecedented amongst all other forest parks across the UK and Ireland, offering maximum play value, inclusivity and challenge for children of multiple age ranges. Designs plans will remain online and display in the Function Hall at Gosford Forest Park for visitors to view and provide feedback until 28 April 2019. As part of the council’s Capital Play Development Programme, the play park in Lurgan Park has been designated for refurbishment, with an investment of £250,000. Before this refurbishment takes place, Council would like to hear resident’s views on where the new play park should be located. There are two options available, the existing site or a new site located close to the entrance of Waves Leisure Complex, Robert Street. 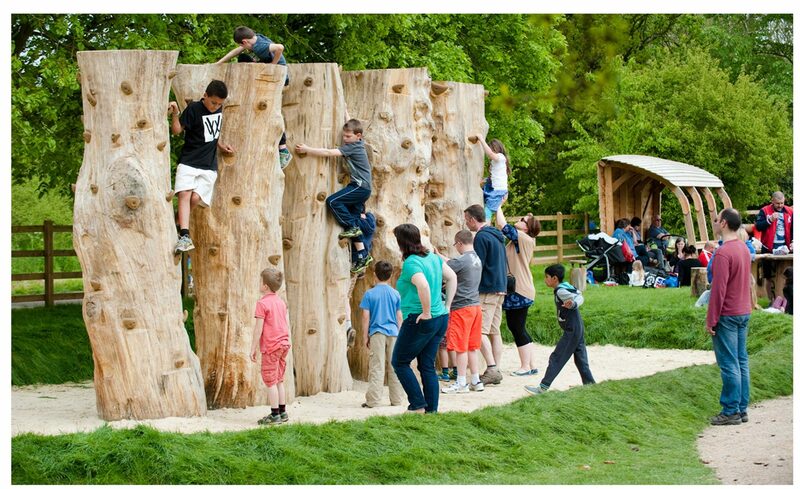 Tannaghmore Gardens Play Park to close temporarily for £250,000 revamp! The children’s play park at Tannaghmore Gardens and Rare Breed Animal Farm is receiving an investment of a quarter of a million pounds to completely upgrade it – and work is due to start in March! The attraction, which is popular with schools and families all year round, boasts a rare breeds animal farm, maze, and large play park which has been loved by children for years – but has been identified as due for an upgrade. The park will close on Monday 11th March for the exciting renovation works and should be completed by July, so children will be able to enjoy the brand new facilities during the summer holidays. The other areas of Tannaghmore Gardens, including the animal farm, will be unaffected by the works. 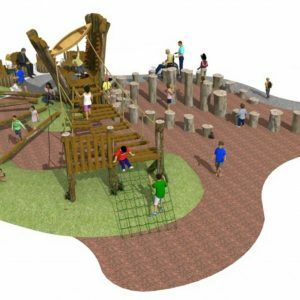 “I am so excited to see the plans for the new play park in Tannaghmore! This facility will represent the largest investment in fixed play so far in ABC Council, and I am pleased that it will be tailored for specific age groups with areas for young children and toddlers, as well as more challenging play equipment, such as a zip line, for older children including teenagers. The £250,000 investment is part of Armagh City, Banbridge and Craigavon Borough Council’s £4.75m Play Strategy 2018-2026. The eight-year strategy puts ABC Council at the forefront of health, recreation and leisure in Northern Ireland, actively championing play to help improve understanding of its critical importance to children and young people. While the play park at Tannaghmore is closed to accommodate the work, children can use the nearby Kinnego Marina play park which was upgraded in 2018. Residents are invited to come along and have their say on a proposed play park in Avenue Road. Armagh City, Banbridge and Craigavon Borough Council is hosting a public meeting at Avenue Road Community Centre on Wednesday 27th February at 7.00pm to discuss the equipment, layout and design. At the meeting residents will be given the chance to have their questions answered about the proposed play area and learn how council aims to implement the good practise design principles outlined within its play strategy, enhancing play value at existing sites and ensuring the future new development delivers a quality play experience for everyone. It is through playing that children, from a very young age, engage with and learn about the world around them. 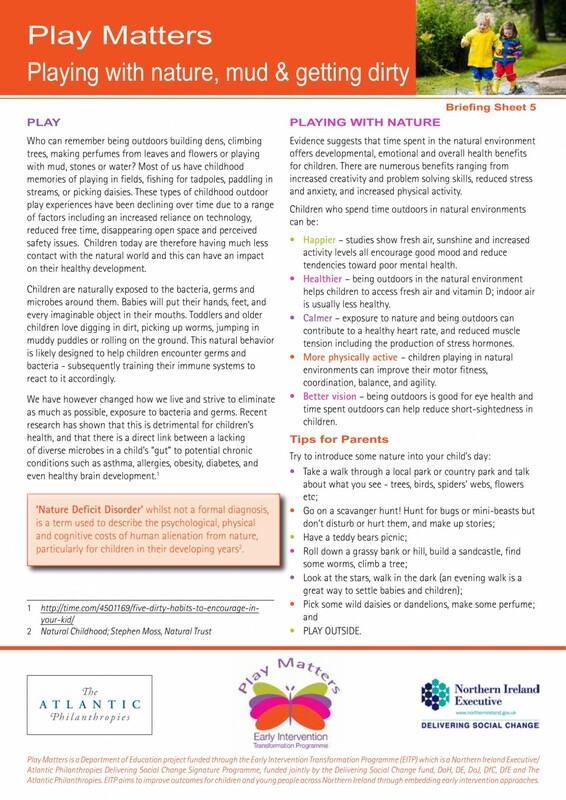 Play allows children to create and explore the world, developing lifelong skills and competencies. From birth through to teenage years, babies and children develop important social and emotional skills through watching, listening and interacting with you and through their play. 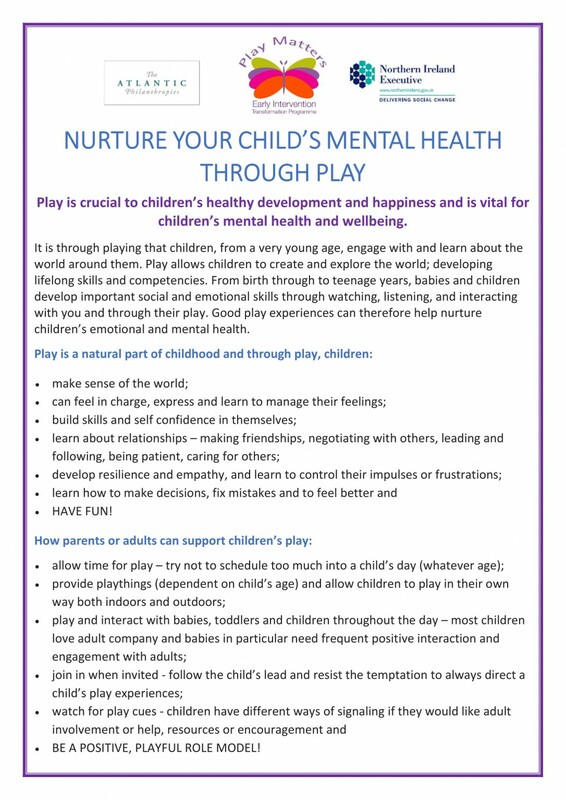 Good play experiences can therefore help nurture children’s emotional and mental health. 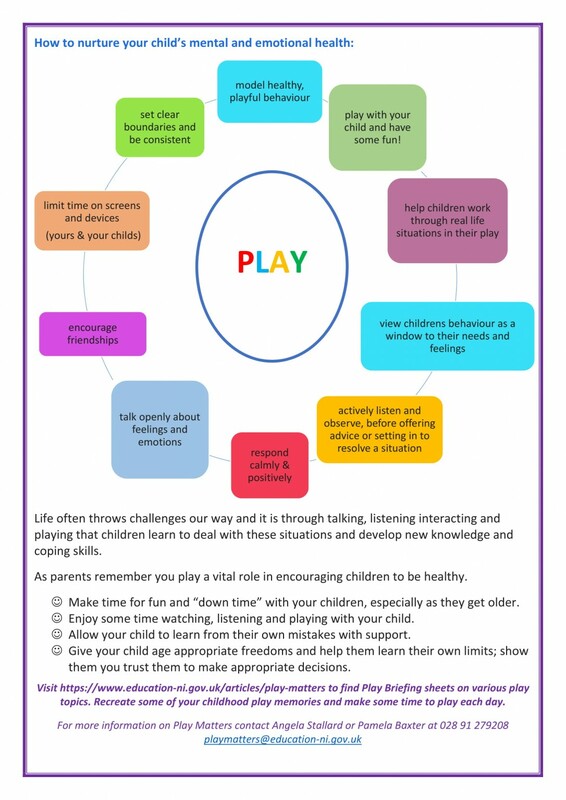 Life often throws challenges our way and it through talking, listening, interacting and playing that children learn to deal with these situations and develop new knowledge and coping skills. 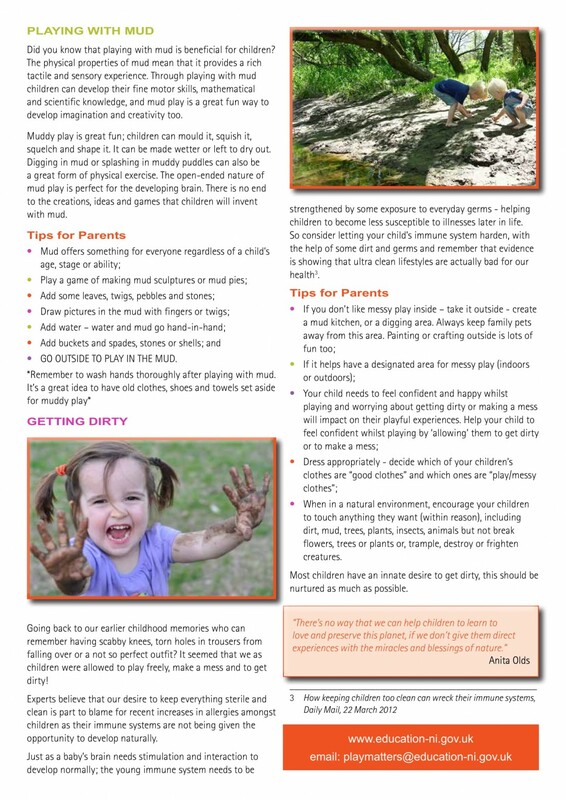 Make time for fun and “down time” with your children, especially as they get older. Enjoy some time watching, listening and playing with your child. Allow your child to learn from their own mistakes with support. Give your child age appropriate freedoms and help them learn their own limits. Show them you trust them to make appropriate decisions. 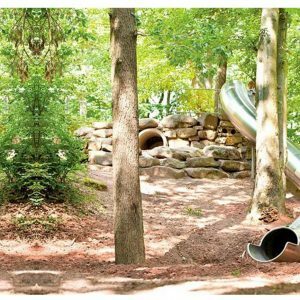 Evidence suggests that time spent in the natural environment offers developmental, emotional and overall health benefits for children. 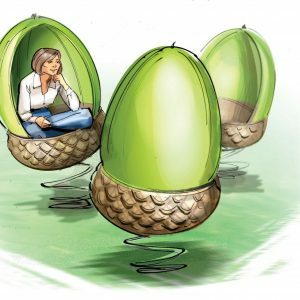 There are numerous benefits ranging from increased creativity and problem solving skills, reduced stress and anxiety, and increased physical activity. Happier – studies show fresh air, sunshine and increased activity levels all encourage good mood and reduce tendencies toward poor mental health. Healthier – being outdoors in the natural environment helps children to access fresh air and vitamin D; indoor air is usually less healthy. Calmer – exposure to nature and being outdoors can contribute to a healthy heart rate and reduced muscle tension including the production of stress hormones. More physically active – children playing in natural environments can improve their motor fitness, coordination, balance and agility. Better vision – being outdoors is good for eye health and time spent outdoors can help reduce short-sightedness in children. Children have an innate urge to play from birth right through to teenage years. 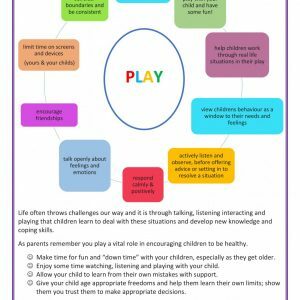 Freely chosen play is critically important for all children as part of their everyday lives and access to quality, unstructured play is known to help improve children and young people’s overall health, well-being and development. 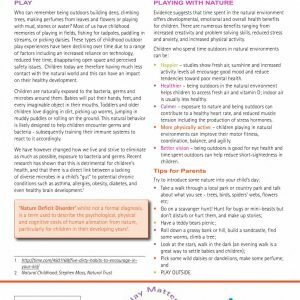 During the early years of children’s lives parents are encouraged to play with their children; these early play experiences can help create a bond and attachment between parents and their children. 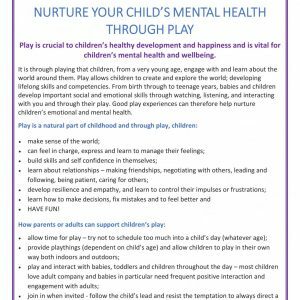 Good play experiences will help children to develop many skills such as self-confidence, self-esteem, curiosity, independence, and resilience. As children grow older they may not call free activity as playing but might prefer for it to be called hanging out or chilling out. It is critically important that adults remember to allow children and young people the time and space to ‘hang out or chill out’. It is during pre-teen/teenage years that children and young people seek greater independence away from their parents/ adults. Friends and friendship groups become very significant and healthy friendships are important. Playing in all weathers… Fun with the Winter elements! 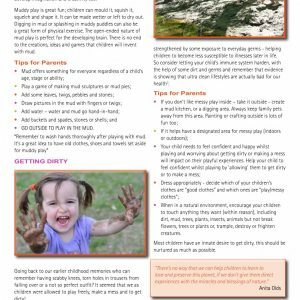 Winter is here and it’s getting colder and darker – but it’s still a great time for getting children of all ages outdoors. We just need to EMBRACE the weather! Have a playful and positive attitude towards the winter season; show your children that winter can be fun. Try to model ways to be playful …. stamp your feet on ice patches or in puddles, have a snowball fight, play in the rain, make snow angels or snowmen! Take a breath of that cold winter air and remember that whatever you do outdoors you are supporting your children’s health, wellbeing and happiness.